I have played and beaten both LBA1 and 2 for a long time now. I haven't played the games for a few months, but I will continue to play them a lot. Anyways, after playing LBA1 and 2 for so many years, I have decided to make a game called, "Twinsen3D", not to get confused of a 3D version of the platform game, "Twinsen". This may sound funny, becuase I was going to call this game, "TwinsenPC". But it sounded kind of stupid to me because that is what LBA1 and 2 basically are. I have worked on this game for only 3 days, and this is what I have so far. 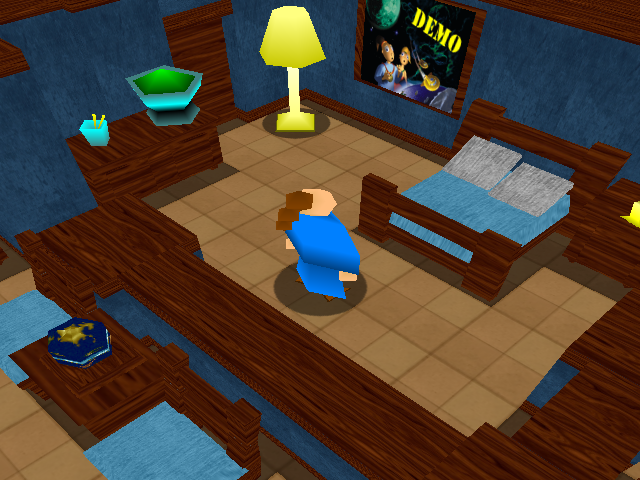 As you can see, it is supposed to look somewhat similar to Twinsen's house in LBA2. If I ever release a demo for this game, this will be the main room where you will start in. In this, I tried to make everything 3D, but not too many polygons, or else everything would slow down. The program I am using to make this game is called, "Game Maker 8.0". Game Maker uses 3D functions, but there are very limited amounts of options that can be done in 3D. Shadows and lighting are kind of a problem in Game Maker. So that is why I made parts of the floor dark, and added circle shadows on certain things. Everything seen in the picture is low polygon, and almost everything is textured. Twinsen, the cup of pencils, the flower vase, and the lamp, these are just colors and gradients. They may be textured later though. And those are the only objects I have right now for the game. If I ever release this, it will be kind of similar to LBA1 and 2. Funfrock will rise again, and you will have to overthrow him once again, just like in both games. The game will be different in ways, probably more magic, more tasks to do, ect. Some of you may have seen my AITD WIP that T posted awhile back. I used the same program for that game. But showing this just proves how much more you can do in Game Maker than low polygon, sharp colors, tirangles, and no textures. Here is a picture of the model of Twinsen. This pretty much just sums up what I have for my game right now. What do you Quetches think? Does it look good? Anything else I should add? I think that game look nice but I don't fully understand rush with showing it. you don't know if you will ever release it. walk in Twinsen house and have one quest for example finding some item in it). Than you finish it and than release. From my side you would have a lot bigger acknowledgment than showing another big but probably never finished project about which you can only say look nice. I probably should do it that way, I am sorry. I am so caught up in certain things nowadays, it's hard to not start something new. I hope you liked it though. But I think I will get pretty far on this. We will see I heard that many time from many different people and projects disappears very quickly. And you don't need to say me how hard it's to hold on one project for long time because I know it very well. And like I said it look nice but most important is not how this project look now because it's a game and without any playable version it will only stay another nice picture. It is actually playable right now. But you can only move around. So for now, it can be an animated picture. I know, its kind of in the right shape though. I just don't want too many polygons or else the game can be slowed down a lot. Its a sphere with only 6 segments. The colors are kind of flashy, but I plan on adding textures to that in the future. No modern GPU should have any problem with you using 2000-3000 polygons for the characters. You can also have way more for scenes; as a general rule of thumb around 100 000 - 200 000 per scene. Although from what I've seen, without animations and any shaders the damned iPad can handle up to a few million polygons per scene and up to 500 000 polygons in the view. I know, but I will just keep the polygons at a low number right now. I don't want to have to go through all of the work again re-editing every single model to a higher polygon count. But thanks anyways.